Comments: Broadleaf evergreen tree which is a cross between Fremontia and the Monkey Hand tree. 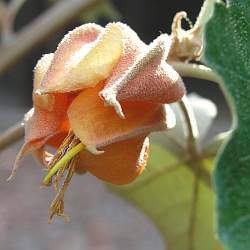 Large broad ovate leaves with three apices, orange to yellow bell shaped flowers, and gray bark. 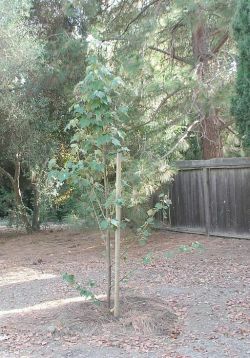 The hybrid species forms into a small multibranched tree to 20' tall. To prevent the transfer of disease and other considerations, do not touch or take samples from the specimen tree or any other plants on the property.